WPI’s student EMS Squad members are pretty easy to spot. With enormous blue packs slung over their backs or at their feet in classes, the library, the dining hall, or wherever they are, squad members drop everything when a call for help comes in. They grab that blue pack and run. Since 1990, highly trained student Emergency Medical Service (EMS) responders rush to aid when there’s a medical emergency on campus. Acting in conjunction with the WPI Police Department, the all-volunteer squad provides coverage around the clock for emergency calls that come in from students, faculty, staff, or visitors. They report to approximately 40 calls per term that require treatment for everything from a rolled ankle to more serious situations. 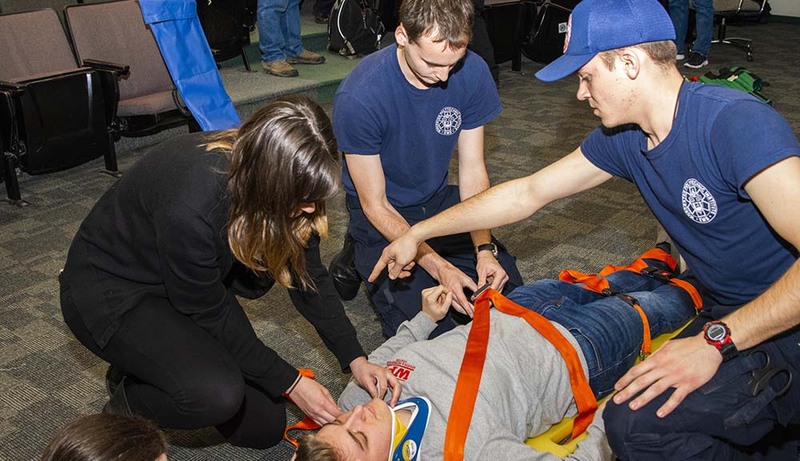 Squad members must have certification as a Massachusetts Emergency Medical Responder (EMR), but many members continue with the program to achieve a full Emergency Medical Technician (EMT) certification and the additional continuing education hours required. They perform at the EMR level on campus to provide basic first aid to stabilize patients and facilitate transport to a medical facility, but the higher level of training makes them more prepared to respond to any situation. The squad was formed as the result of an IQP, and membership has fluctuated over the years. There are currently about 24 members, says Muise, up from about half that when he first joined. Responders work within the physical campus (they do not respond to off-campus areas, including fraternity houses) and can also report to Faraday Hall and Gateway Park if WPI Police officers drive them. Most squad members are on call 20 to 24 hours a week. While their service is invaluable to campus, the personal rewards are deep. Squad personnel lieutenant Haley Ornstein ’20, has never wavered from her dream of being a doctor. She knows the direct patient care experience as an EMT will give her greater insight, so she joined the WPI squad last year. This summer, she plans to apply for work as an EMT for the Boylston Police Department, which many WPI EMTs do. Ornstein says it’s a privilege to offer care when people are at their most vulnerable. “They are probably scared, and they are trusting us to come fix it,” she says. Using Google Docs to coordinate shifts, students learn to juggle responsibilities and any open spots are quickly filled. Many responders chat with professors before the start of classes to see if they mind if a student has to leave class for a call. If a faculty member is not comfortable, the student knows not to schedule a shift during that class.